Blue honeysuckle esp. 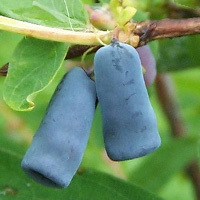 haskap is called antiaging berry in Japan where it is harvested Hokkaido. It is used to make jelly as well as alcoholic beverages. Besides eating haskap as is, it can be added to yogurt or used to make juice. The calories in Haskap per 20g(10grains approximate) is 11 calories. Haskap is calculated to be 53Cal per 100 grams making 80Cal equivalent to 150.94g with 2.56g of mostly carbohydrates、0.14g of protein、0.12g of fat in 20g while being rich in vitamins and minerals such as Vitamin C and Vitamin E Alpha Tocopherol.